I received a box of produce from Melissa's for recipe development and a serving platter from Le Creuset for #FabulousFallBounty. All opinions are honest and my own. 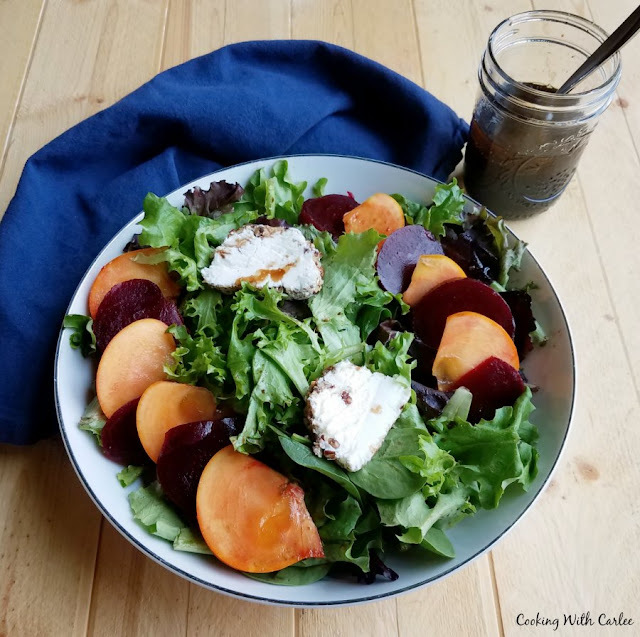 A fun sweet and savory salad with beets, persimmons, goat cheese and pecans lightly dressed in a homemade salad dressing. It is a perfect starter or a great lunch. I couldn't get a big box of produce from Melissa's without putting together a great salad. 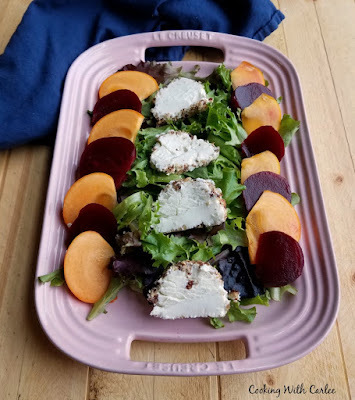 The instant I saw the steamed and peeled beets, I thought they were the perfect thing to build a salad on. Have you seen them in the store? They take all of the mess out of prepping the beets. Plus they are instantly ready for a salad! I had ordered a roasted beet salad from a regional Italian restaurant a few years back on the recommendation of a friend. She said it was one of her favorite things on the menu, and their menu is big and delicious. While the restaurant it in my region, the nearest one to me is a few hours drive away. So when I committee I was on decided to hold a lunch planning meeting at one of the restaurants I was more than happy to make the drive to attend. I didn't even have to see the menu to know what I was going to order. This salad was mostly roasted beets with some avocado and little balls of goat cheese rolled in chopped nuts. There were just a few greens and a drizzle of dressing. It was simple and really delicious. After that, it was my go to order at that restaurant as well. The fact that I was almost always there for lunch and almost always had a few hour drive ahead of me made ordering a light salad more appealing than a heavy pasta lunch that would make me want to nap instead of drive. Besides, when something's good, it's good! So my immediate thought upon seeing the beets was copycat that recipe. But the Fuyu persimmons caught my attention as well. I love fruity salads with plenty of cheese and nuts, so I decided to abandon the original idea and switch it to a bit more of a full salad. The pretty colors of the orange persimmons and burgundy beets would make a festive salad fitting for a dinner party or holiday table. I was still tempted to roll balls of goat cheese in nuts, but decided rolling the whole log in nuts and slicing it would give a similar effect with less work. Less work is always good, so of course that's the way I went. 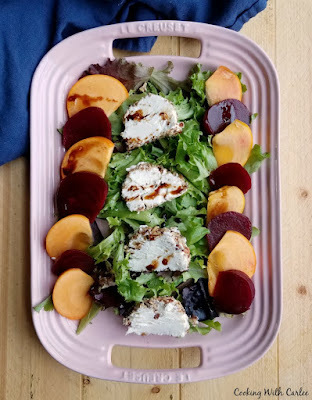 I loved the combination of textures and the way the sweet beets and persimmons played against the tang of the goat cheese and peppery greens. A salad like this doesn't need a ton of fancy dressing. So just a little simple mix of fruity balsamic and olive oil lightly sweetened with a bit of maple syrup and seasoned with salt and pepper does the trick. It's quick, easy and lets the flavors of the produce and cheese shine. We have been really enjoying some special salads around here. 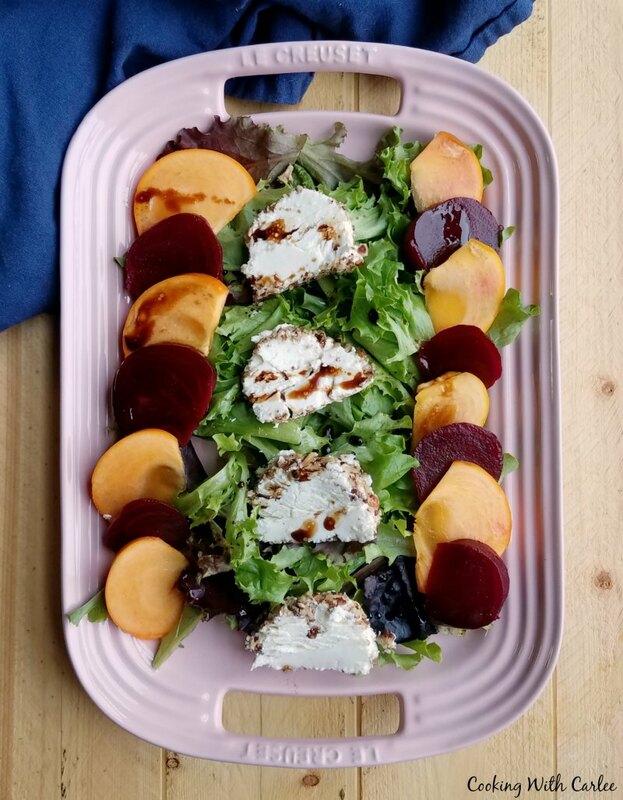 This summer we were loving on red white and blueberry salads, this fall it was apple cranberry dinner salads and now for late fall and winter this persimmon and beet salad is my thing. What are your favorite ways to fix a special occasion salad? Do you have a signature dressing or a combination of toppings that are sure to wow? Mix together all dressing ingredients and refrigerate until ready to use. If you have time, toast the pecans. Chop the pecans, toasted or not into fine bits. Roll the goat cheese log in the chopped pecans. Wrap in plastic wrap and refrigerate until ready to use. When ready to serve, pile the serving platter or bowl with greens. Slice the persimmon and beets and arrange over the greens. Slice the goat cheese into thin slices and arrange on salad. Stir or shake up dressing and drizzle over salad. Serve immediately. Now, that is quite the salad. perfect for Fall and I think I told you, we love persimmons! 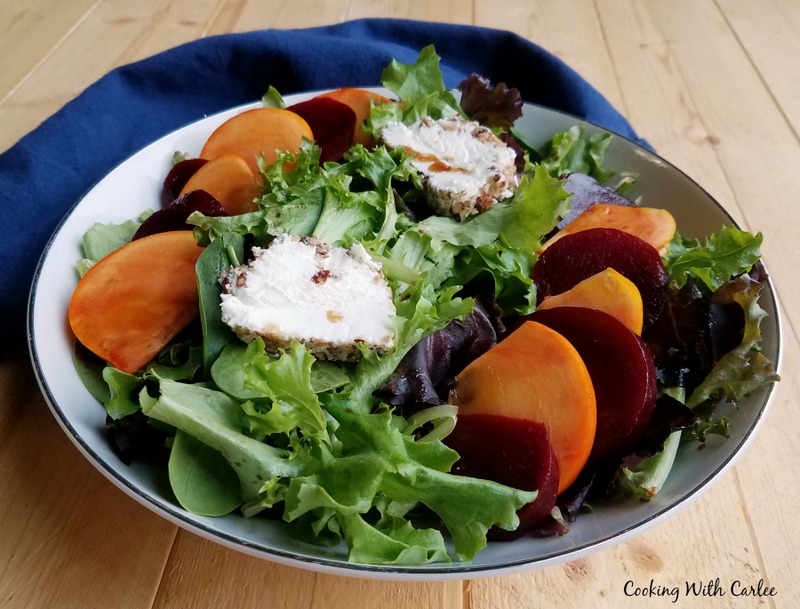 I love reaping the bounty of Fall with yummy salads like this! What a keeper! That is one gorgeous, colorful salad. Isn't it like a jewel box? 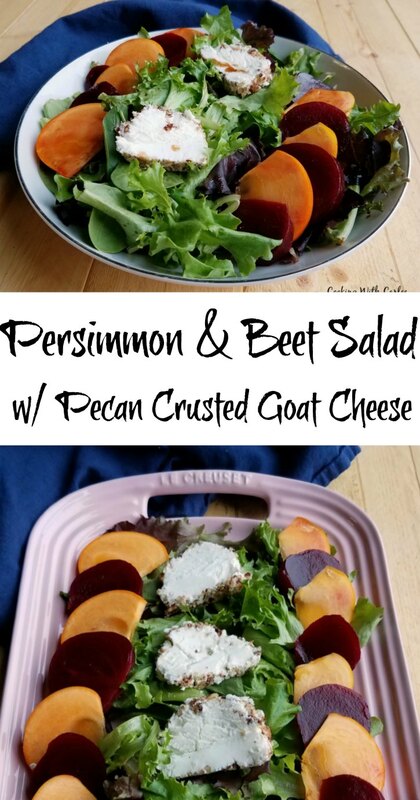 I just pinned your awesome Persimmon and Beet Salad! Thanks so much for sharing with us at our Thanksgiving Edition of Full Plate Thursday! Hope you have a great week and come back soon! Thank you and I hope you had a great Thanksgiving!